When creating draft files in Solid Edge, many times these need to be exported to a .dwg or .dxf to then be workable in AutoCAD. If these files are going to be opened on a machine without Solid Edge installed, it will not have the fonts that Solid Edge uses in its draft files. This naturally can cause some issues, and there are a few limitations of how SE can translate its fonts. Dimensions use the seans.ttf (Solid Edge ANSI) for the Diameter symbol which in the font occupies the space traditionally used for the capital O. There are no fonts delivered with AutoCAD or Windows that have a diameter symbol in this position. However, there is a way around these issues. If the fonts cannot be sent to the AutoCAD computer, you can use a callout instead of text boxes to put symbols in. 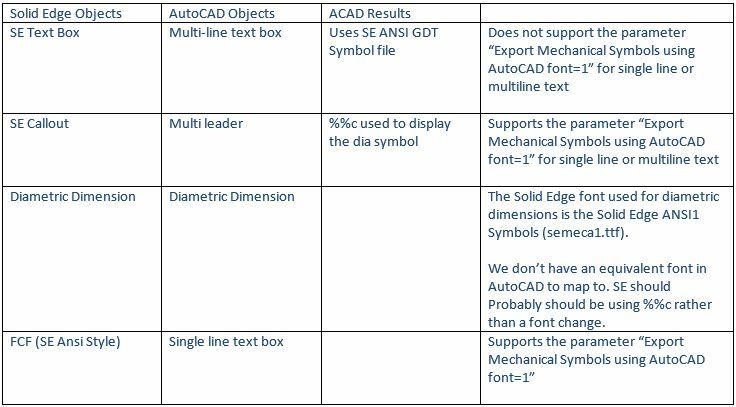 You then will need to change the entry Export Mechanical Symbols using AutoCAD font to 1 in the seacad.ini file. This will export the feature control frames in a way that AutoCAD can read.
" If the fonts cannot be sent to the AutoCAD computer, you can use a callout instead of text boxes to put symbols in. You then will need to change the entry Export Mechanical Symbols using AutoCAD font to 1 in the seacad.ini file. This will export the feature control frames in a way that AutoCAD can read." What does this mean? "use a callout instead of text boxes to put symbols in." Also suddenly at the end you mention feature control frames but I don’t know in what context. An example would do wonders, I think.